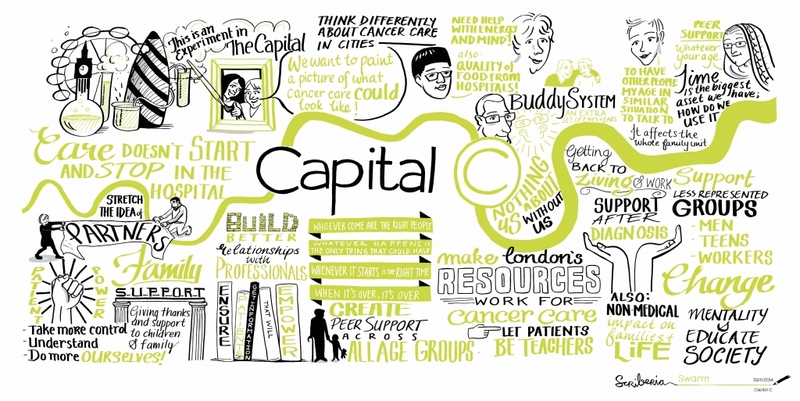 Capital C is a collaborative project with Macmillan Cancer Support, putting people affected by cancer at the heart of developing a collaborative London-wide strategy for cancer care. The project has brought together people from all walks of life who have been affected by cancer with a set of diverse, innovative organisations who are supporting them. We have looked beyond traditional health and social care settings, and explored where people get the support they need in London - whether it’s at home, work or the supermarket. After a number of stories shared and human connections made, the collaboration is well underway and the Capital C community and Macmillan continue to work together to develop a new approach to cancer care in the city.